“Big Hero 6” is an animated, fast-moving comedy/adventure film centering on 14-year-old science nerd/robotics whiz Hiro Hamada (Ryan Potter). 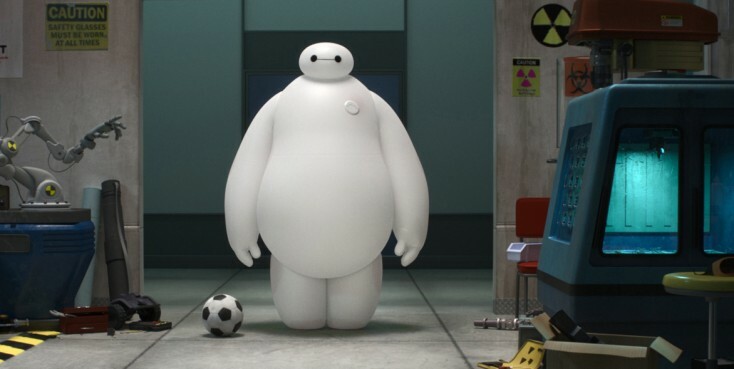 He seeks revenge for a family tragedy with the help of fellow eggheads—the super fast-thinking and acting GoGo Tamago (Jamie Chung), freaked out perfectionist Wasabi (Damon Wayans Jr.), chemistry whiz Honey Lemon (Genesis Rodriguez), fanboy Fred (T.J. Miller) and a loveable, squishy, hugable healthcare robot named Baymax (Scott Adsit). In the process, Hiro learns to channel his genius and tame his vengeful spirit. Living in San Fransokyo, a mash-up of San Francisco and Tokyo, brilliant but unfocused teen genius Hiro would rather bet on illegal ‘bot fights than think of training his razor sharp mind at tech school. That is until his older brother Tadashi (Daniel Henney) shows him a fun science lab full of nerds like Hiro and introduces the teen to his major invention Baymax, a supportive healthcare robot that also has a touch of Mary Poppins in his programming. As a project which can earn his enrollment into the posh tech school, Hiro creates minibots, tiny robots controlled telepathically which, together in a swarm, can transform the world as we know it. When greedy tech industrialist Alistair Krei (Alan Tudyk) evidently sets a fire at the school and steals the ‘bots causing Hiro an awful loss, the genius boy seeks revenge by transforming his new scientist pals and Baymax into superheroes who can go after the masked enemy now controlling his invention … but is he actually Krei in disguise or an enemy Hiro never considered? Directed by Don Hall and Chris Williams from a screenplay by Robert L. Baird and Daniel Gerson based on a Marvel comic book, “Big Hero 6” has the heart of Brad Bird’s classic “Iron Giant” and the superhero swash of “The Incredibles.” The movie displays amazing East meets West production design with incredible detail. It also entertains with a great emotional range and boasts a worthy moral core; stressing that revenge is not going to heal the soul or change the past. The film also pushes the premise that science can be very, very cool. The voice cast never misses a beat. Miller as the voice of fanboy Fred is very funny and James Cromwell adds gravitas as formidable professor/scientist Robert Callaghan, who is much more than he seems. The familiar Disney animated themes of love and loss, coming-of-age self-discovery and family unity are there in abundance with a supporting cast of characters that, while we never learn much about them individually, have distinct personalities and skills that aid lead character Hiro and his new best bud Baymax. I defy you or the kids in your life to remain aloof to the Baymax brand of charm and simple, loveable goodwill. The film is definitely set up for a series of movies featuring Big Hero 6, the new undercover protectors of San Fransokyo and audiences are likely to be onboard for whatever comes next. Also accompanying “Big Hero 6” in theaters is the adorable animated short film “Feast,” featuring a stray puppy, who loves junk food and helps his adoptive owner find and keep the girl of his dreams.